I have spent much of my working life calculating the dynamics of systems, be they complex sets of calculations for a Bank, the solving of massive sets of differential equations or calculating how many days, hours and minutes a project will take and how many pounds, groats or donkeys it will consume. So when I saw an article in New Scientist with the title of this post, I had to read it. In my modelling of complex systems, nearly fifty years ago, I used state-of-the-art, digital and analogue computers to model complex interactions in chemical reactions and plants. In more than one case the answer that was obtained was unexpected. But then you can’t argue your feelings against thoroughly correct mathematical equations! The same is happening in this transport example. Your feelings may say faster trains will get you there quicker, but properly modelled it would appear that the reverse may be true. One thing that may be true in some places, is that adding new stations to a line reduces the time taken to commute. So sometimes residents wanting a new station near their houses, may just be right! Only a rigorous mathematical model will tell the truth! Leeds seems to have an ambitious station building program, whereas only one new station;Lea Bridge, is being built in London. And intriguingly in London, Crossrail is being built with only one new station; Woolwich, although some are being substantially rebuilt! I hope they’ve done their modelling extensively enough! I like this story from the BBC’s web site. One of the keys to fighting cancer is good diagnosis and the article shows how being clever with scientific, engineering and mathematical tricks, X-rays can be improved. We’ll see a lot more of this type of innovation in the next few years and it’ll help in all sorts of fields and not just medicine. I’m 65 this year. Could my generation’s everyday maths, be better, as we had to cope with £sd? When I served in a bar in the 1960s, you learned things like 3 bottles of Guinness at 1s. 8d. were 5s. You had to do it all mentally, as the till was just a drawer. I also played a lot of cribbage and other card games. Many of which need a certain amount of arithmetical dexterity. So have computer games lost all this? But in some ways my biggest advantage was that my mother had very good arithmetical skills, partly brought on as she had been a comptometer operator before and during the Second World War, at Reeves just down the road from where I now live. So when we travelled in the car, she would always set me puzzles. Interestingly, comptometer is rejected by the computerised spelling on this computer and WordPress. It would appear that nothing changes here in some subjects. The main news story is that Michael Gove wants to reform A levels and give the universities more control. He states that some A levels don’t prepare some students for their University courses. Was it ever any different? When I went to Liverpool University in the 1960s, my maths was good, especially as I had done a Further Maths exam after my normal Pure and Applied Maths. The latter incidentally was dropped soon after I took it, despite it being the most useful to engineers. Others though, did not have my maths skill, despite having got an A level. So a lot of my first year was spent relearning maths, so I could be a good engineer. In fact, the problem was even worse. Until the year before me, the Engineering Department at Liverpool, got the Maths Department to teach maths. But they had found it was taught so badly, that they took to teaching it themselves. That was sixty years ago! I’d love to see a current Maths A level paper and see how much is within my knowledge. 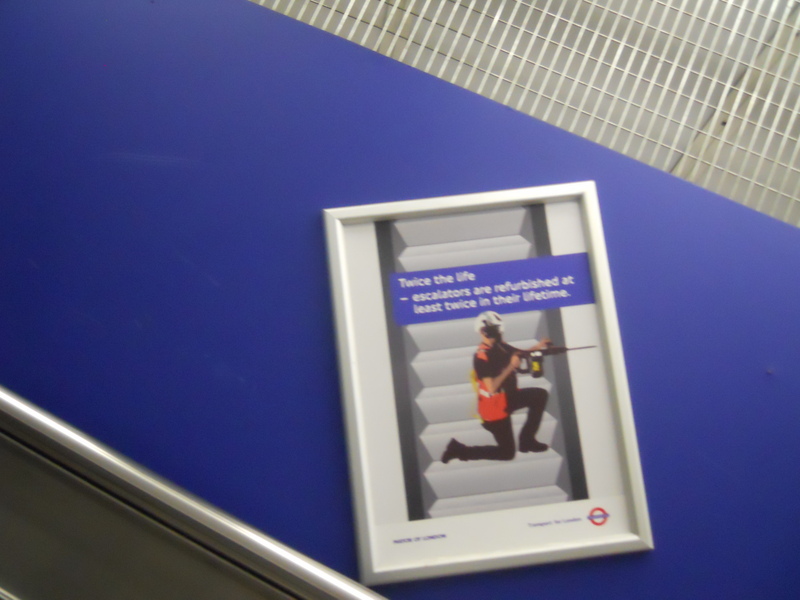 When the London Underground replaces or refurbishes an escalator, they put posters on them to amuse and inform. One says. Twice the life. Escalators are refurbished at least twice in their lifetime. Here’s a picture of the error, that I took later. If the refurbishments make the escalator as new, surely two will treble the total lifetime. Richard Bacon on BBC Radio 5 Live, has just asked the comedian, Paul Foot , if after his degree in Mathemetics at Oxford, he was planning to be an accountant. Mathematicians would never lower themselves so much to do something as boring as accountancy. Does this just show how narrow the average interviewer on the media is? Sathnam Sanghera is one of The Times columnists. He is also someone who I try to read each week. I suppose that despite his background from an Indian family in Wolverhampton being very different to mine of a group of London mongrels, that we have a lot in common. He usually makes me laugh a bit and always makes me smile. Take this first paragraph from his piece yesterday which was ostensibly about cats and their relationship with men. If you’d asked me, at the age of 10, what my life would be like at the age of 33, I would have probably mentioned a semi-detached in Wolverhampton; the 2009 equivalent of a Ford Orion on the drive; a Punjabi wife of ten years or so; a couple of spoddy kids who, like me, were good at maths, but crap at English and sport; a job at a local building society; a garden; male pattern baldness, and a cat. That I have none of these things is not a cause of distress or concern — they might still come and, besides, more thrilling things, such as houseplants, have taken their place. But it does puzzle me that I still don’t own a cat. If you’d asked me the same question at about the same age, I would have probably thought something similar, except that I’d be running my father’s printing business in Wood Green. So we do have a lot in common. The most interesting thing is that Sathnam says, that he was good at maths, but crap at English and sport. And here is Sathnam writing well-crafted articles in one of the world’s premier newspapers. In fact, as his column is probably syndicated, then it might be several. I was the same! Maths good, English bad. But now, even if I say it myself that is not true. The maths and its usage is still good and that of those around me sadly gets worse. Does teaching not instill the joy of maths, physics, chemistry and the other sciences into students any more? But it is my English that has improved so much! Why? I don’t know. Perhaps, Sathnam could tell me, as it’s probably the same reason his has improved. I was crap at sport too. But now I play a lot of real tennis and was actually a National Champion a couple of years ago. Don’t tell anybody, that it was in my handicap group and only five people entered! So there is hope for Sathnam’s sport too!